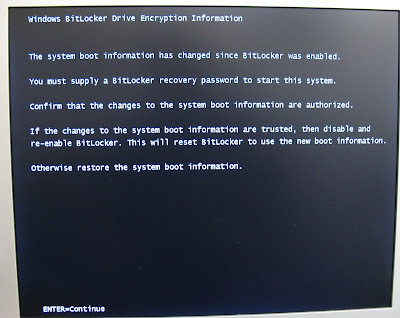 MPECS Inc. Blog: Windows Vista - BitLocker Error - "system boot information has changed"
Windows Vista - BitLocker Error - "system boot information has changed"
When setting up BitLocker, it gets us to create a text file with that password in it. We put that file onto a network share. This screen is happening every time we boot the system. Since we are testing things, the machine is not setup on our domain yet. 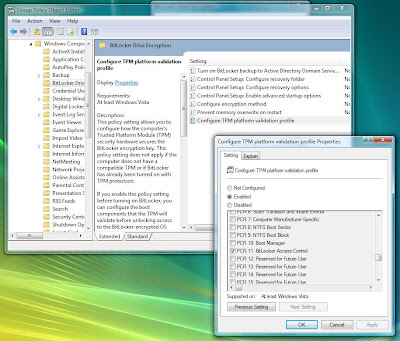 What we can tell from searching is that we need to make some settings changes to the local machine's Group Policy, or at the domain Group Policy level before enabling BitLocker on any machine attached to the SBS domain. For a standalone system if BitLocker has already been enabled and the error is showing itself, disable BitLocker, decrypt the system drive, and reset the TPM. Reboot the system, reinitialize the TPM and run the BitLocker Drive Encryption tool to create another key and encrypt the drive. You can test that the settings have taken by rebooting the system after pausing the encryption process at 1%. Note that a UAC prompt will happen after clicking the Pause button on the BitLocker encryption process window. In our test on the stand alone system, it worked. We were no longer prompted for the BitLocker key when rebooting. We unplugged the system - did not remove the battery - and let it sit a while to make sure. Again, the system came backup without a BitLocker password prompt. For an SBS domain attached system where the SBS server has been RipCurled (previous blog post), one would make the settings change to the Windows Vista Group Policy Object from a Vista box logged in as the domain admin. 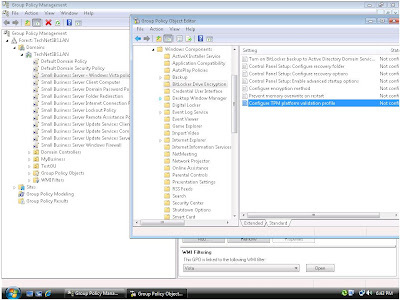 Note all of the extra Vista related policy settings that are accessible when managing the SBS Vista Group Policy Object from a Windows Vista machine. Information on the workaround was found on the TechNet Forums: BitLocker requests encryption key at every reboot. By the way, a very critical consideration in all this is: What will happen to the BitLocker setup when a BIOS update is done? We will definitely be watching out for the next JOE update to test that one! And secondly, the TPM on both the DQ965GF series and the DQ35JOE are both 1.2 compliant ... meaning that they will work with BitLocker with no issues.